In this article we will show you, How to write a C Program to Print Inverted Pyramid Star Pattern with example. And also show you, How to print Inverted Pyramid with different symbols. 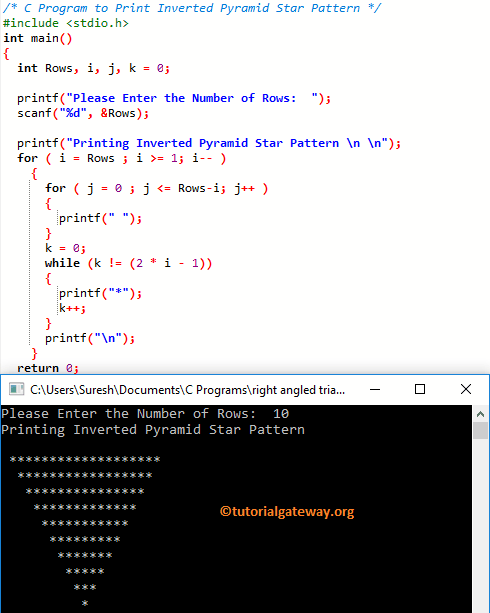 This C program allows the user to enter the maximum number of rows he/she want to print as Inverted Pyramid Star pattern. Here, we are going to print the inverted Pyramid of * symbols until it reaches the user specified rows. The j value is 1 and the condition (j <= 9) is True. So, it will start executing the statements inside the loop. So, it will start executing printf(” “) statement until the condition fails. The k value is 0, and the condition k != 2*i – 1 is True. So, it will start executing the statements inside the loop. So, it will start executing printf(“*”) statement until the condition fails. Next, iteration will start from beginning until both the Inner Loops, and Outer loop conditions fails. In this C program we just replaced the While Loop with the For Loop. I suggest you to refer For Loop article to understand the logic. This C program program allows the user to enter the Symbol, and number of rows he/she want to print. It means, instead of printing pre-defined stars, it allows the user to enter their own character.